A response to the review “Evolution is Still Puzzling” (2008) of “Pieces of Evolution’s Puzzle” (2008) that makes an attempt to answer the challenge of a lack of alternative to evolutionary theories in human-social sciences. By putting forward a candidate for a legitimate alternative to evolution, the evolutionary puzzle and its exaggeration from biology into improper humanities fields is potentially solved. This paper offers a paradigm shift primarily for sociology, the author’s home field, but also for four other fields that have been neutralized from providing peaceful alternatives in the study of change and development for human societies, instead of succumbing to the totalising logic of evolutionistic ideology. 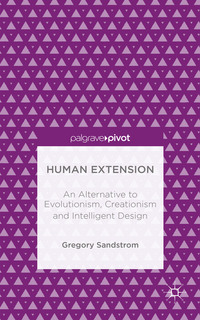 Human extension marks a moment of reversal from evolutionism with its arrival as a post-evolutionary general methodology. The only way to achieve peace in the warring controversy over evolution is to put evolutionary theory in its proper scholarly place, refusing to allow it to be over-estimated in the Academy. The same was true with relativity theory in physics; it has only a limited conceptual transferability into human-social thought, philosophy and ethics. In making a principled categorical clarification about ‘evolutionism,’ those who choose to uphold evolution as a world-view, as the primary basis for their special sciences, philosophies, or (a)theologies, can be identified for their attempt to ‘universalise evolution,’ rather than limiting it within appropriate and responsible, meaningful boundaries. I responded saying that I think referring to modern evolutionary theory as ‘Darwinism’ is problematic. My contribution to the ensuing discussion is gathered into one message below. Human Extension and Theistic Evolution/Evolutionary Creation – What Happens When ‘Neo’ Comes? Much of what I wrote in the previous post can be likewise directed toward the two positions called ‘theistic evolution’ (TE) and ‘evolutionary creation’ (EC). These two similar views are particularly popular among monotheists of the Abrahamic faiths who have little problem with the natural-physical science of evolutionary biology and at the same time who reject ‘young earth’ (YE) arguments based on a literal reading of the first two chapters in the Book of Genesis. As Robert J. Russell says, “evolution is God’s way of creating life.” (2003: 336) This ‘camp’ of thinkers called TE or EC is more openly religious than ‘intelligent design’ (ID) proponents due to the fact that they include ‘theism’ or ‘creation’ in their respective labels.